Del Mar offers from unique beach condos and townhomes in the ocean front to luxury condominiums with magnificent cost and ocean views. Besides the Beach Colony, you will find condos for sale in the neighborhoods of Del Mar Woods, Olde Del Mar, Del Mar Village, Del Mar Beach Colony and Del Mar Heights. On the market for a home, condo, townhome or vacation property in the world famous community of Del Mar? Click the button below to see all currently listed Del Mar condos and homes for sale. Prices for a 2 bedroom condo start from the mid $400,000 in Del Mar Heights, from the low $700,000 in Del Mar Woods, ocean view condominiums start from the high $700,000 and Del Mar beachfront condos are in the $5,000,000 and above range. Call us today at (619) 921-0284 for more information and availability on Del Mar condos for sale. Del Mar is one of the most beautiful and romantic upscale resort beach towns in the world. Just imagine a romantic vacation getaway to a quiet, relaxing and scenic village on the beautiful Pacific Ocean, with excellent restaurants, romantic getaways, beach and race season vacation homes, lots of activities, including the exciting Del Mar Racetrack and San Diego County Fair, as well as beach & ocean water sports, and the nearby San Diego, La Jolla and North County attractions. Del Mar is two square miles along the Northern San Diego County coast, best known for its beaches, fairgrounds and the Del Mar Thoroughbred Club “Where the turf meets the surf.” With beautiful sandstone canyons interspersed with hillsides of custom homes, and astonishing sunsets, the romantic village of Del Mar is a global destination point for visitors, vacationers and residents alike. Just two blocks from the ocean, Del Mar Village features quaint boutique shops, clothing stores, art galleries, restaurants, cafes, Del Mar Plaza, Stratford Square, L’Auberge Del Mar Hotel Resort. The heart of Del Mar’s downtown village is Camino Del Mar and 15th Street, where you can shop or dine at Del Mar Plaza and Old Stratford Square, This part of town has a spectacular view of the ocean. Del Mar downtown village is a short walk to Seagrove Park, Powerhouse Park, and Del Mar City Beach. Del Mar City Beach stretches from 15th Street near Seagrove Park and Powerhouse Park northward to the cliffs at Dog Beach. 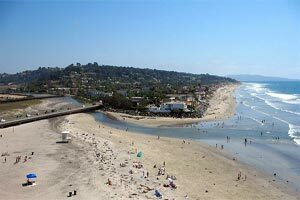 Del Mar Beach is a great place for swimming, surfing, walking, and jogging. The beach is generally sandy with some cobble stones here and there, and is lined with unique multimillion dollar beach front homes. Condo communities in Del Mar, CA include Ocean Front, Del Mar Woods, Playa del Mar, Coast Del Mar, Stratford Woods, Chateau L’Auberge, Coast Blvd Condos, Sea Point, Spindrift, Spindrift Del Mar, Sea Village, Normandy by the Sea, Villa Oceana, Del Mar Villas, Casa del Mar, Sea Cliff Terrace, Ruette Le Parc and Del Mar Bluffs condos.